candle is made by hand and no two are alike. here to show the top. 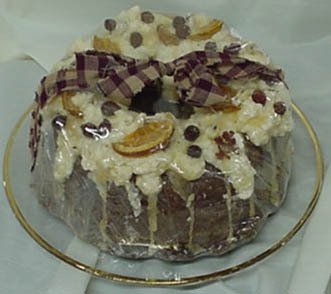 Top and Bottom View of our Grubby Bunt Cake. Candle is wrapped and tied with a homespun bow! This is an all wax candle. bunt to catch wax dripping that may occure. A quarter is propped up beside the cake side. Drizzled with wax goo, covered with wax nuts and wax sprinkles. Just pick any scent off of any of the scent list and we will create one of these highly scented cakes for you! Don't want any scent added at all? We can do that too! 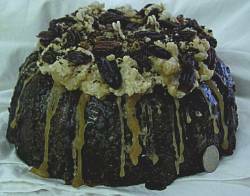 How about an all burgundy bunt cake smothered with wax pecans, wax rose hips, and dried apples or oranges? White drizzled in red, chocolate, or caramel just ask. Just email us your choice if it is different from the ones above and we will take care of it. 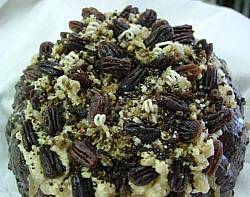 Country Primitive Scented Candles at a wholesale or retail are all handmade. We think ours are the best handmade country primitive scented candles around at wholesale or retail prices, try one for yourself. All candles on this page have free shipping included. There is no additional charge to you. Applies to continental U.S.A. only.